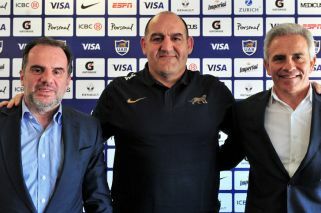 New Argentina coach Mario Ledesma has named six uncapped players in his first squad ahead of the four-nation Rugby Championship that begins on August 18. Forwards Lucas Favre, Marco Ciccioli, Diego Fortuny, Santiago Grondona, Franco Molina and Mayco Vivas were all included in a 36-man squad by Ledesma, who took over from Daniel Hourcade last week. Tomás Lezana and Leonardo Senatore were the main absentees due to injury while Tomás Cubelli and Matías Moroni were recalled. The Pumas will train in Buenos Aires before flying out to Durban on Saturday. They begin the tournament with back-to-back fixtures against South Africa. Argentina, who were semi-finalists at the 2015 World Cup, finished without a point in last year's Rugby Championship after losing all six of their matches. They have slumped to 10th in the World Rugby rankings and barring a victory in Italy last November, it's almost two years since Argentina last beat a tier one nation. Squad (36): Matías Alemanno, Gonzalo Bertranou, Emiliano Boffelli, Rodrigo Bruni, Sebastían Cancelliere, Agustín Creevy, Tomás Cubelli, Jerónimo De la Fuente, Bautista Delguy, Joaquín Díaz Bonilla, Bautista Ezcurra, Santiago García Botta, Santiago G. Iglesias, Marcos Kremer, Martín Landajo, Tomás Lavanini, Juan Manuel Leguizamón, Juan Cruz Mallía, Pablo Matera, Santiago Medrano, Julian Montoya, Matías Moroni, Ramiro Moyano, Matías Orlando, Javier Ortega Desio, Guido Petti, Nicolás Sanchez, Nahuel Tetaz C., Juan Zeiss, Marco Ciccioli, Lucas Favre, Diego Fortuny, Santiago Grondona, Vivas Mayco, Ignacio Larrague, Franco Molina.